"Because of epidural stimulation, I have more confidence and self-esteem than I've ever had." Meet Rob, the first participant in epidural stimulation research funded in part by the Reeve Foundation. 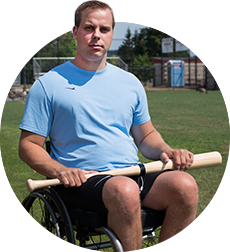 "I was in my driveway when I was hit by a car - the accident left me paralyzed from the neck down." What was your life like before your injury? "I played baseball in college and was looking at a major league career. Needless to say, my injury changed that." How has the epidural stimulation research changed your life? "When I was injured, I was told I'd never walk again. It was a permanent thing. But since participating in the first study, I can move my arms and legs and have control of other functions that are really important to quality of life. It's incredible just to be able to feel the breeze against my legs on a nice day. Now I'm able to coach youth baseball, and I also like to try to help other people with paralysis by speaking every chance I get." The groundbreaking discovery that it may be possible to "reawaken" the spinal cord following an injury - even years after the trauma. Rob, Kent, Drew and Dustin are living proof that epidural stimulation has the potential to be effective for the millions living with paralysis and other conditions that impact movement. A new group of men and women will help demonstrate that epidural stimulation is an effective, game-changing therapy for people with paralysis. Our goal is to fund epidural stimulation research in 36 new participants — men and women from a range of backgrounds — to prove its efficacy. Get in on the ground floor with what we believe will be the new cornerstone therapy by investing in the research now.